With thanks to Peter Wilcock's daughters in Canada for permission, and to Denis Pickles for providing the scans. 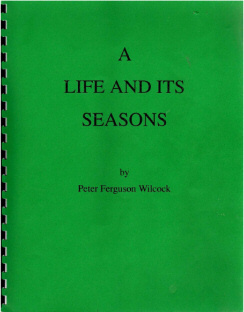 This 24 page manuscript is the first part of a sadly unfinished autobiography, written by Peter Wilcock, in which he writes about his life as a child in Sutton during and just after World War II until the family emigrated to Canada in 1948 in search of a better life. Peter was the grandson of Tom Lister Ellison, one of the "Old Sutton Warriors" and one of Denis Pickles' dearest friends. Peter F Wilcock, Associate Professor in the Department of Pediatrics, died on 27 October after an illness. Besides being with the Department of Pediatrics, Dr. Wilcock was on the active staff of the Charles Camsell Hospital and was the Pediatrician to the Hobbema and Duffield Indian Reserves. Born in England, Dr. Wilcock received his High School education in Sherbrooke, Quebec. After matriculation, he won the Sir Edward Beatty Scolarship to Bishops University; at that university, he took honors courses in biology and chemistry, graduating in 1955 with a BSc degree. He then entered McGill University in Montreal to study medicine. He graduated in 1959. In 1964 and 1965, Dr Wilcock received his Certificate in Pediatrics from Royal College and Fellowship in Royal College of Physicians of Canada respectively. After Peter died, a library at the Charles Camsell Hospital in Edmonton was named after him.